The chart seemed to be fixed by Tuesday although Apple hasn’t commented. Apple doesn’t actually host any podcasts, but it dominates the industry. According to some estimates, 55% of listeners consume their audio content through the Podcasts app or iTunes. So Apple’s top charts are a big deal for podcasters – often, new listeners check them to find shows to listen to. At the very least, it’s one ranking of which podcasts are popular with people. And over the weekend, people noticed that the charts didn’t make sense. For example, Serial, which just came out with a new season and is seen as one of the most popular podcasts, was several spots down the charts – going as low as No. 26 on Monday. At the top were newer, lesser-reviewed podcasts – “Bulletproof Real Estate With Andy Dane Carter” was No. 1 for a while – including shows about working out and business, which are not the typical subject matter for top podcasts. “To my eyes, which hasn’t looked at the Apple Podcast platform in a good while, the charts felt distinctly… broken,” Nicholas Quah wrote in his newsletter, Hot Pod, a sort of “Paris Review” for the mattress-ad set. On Tuesday, however, the problem seemed to be fixed: Serial was back to No. 1, closely trailed by Joe Rogan’s show and other brand-name podcasts. Apple didn’t respond to an emailed request for comment on Monday, while the charts were still showing an odd ranking, or on Tuesday, after the issue seemed to have been fixed. Quah wasn’t the only person to notice that the charts were weird – and several of them pointed to the same explanation: People were gaming the system. “We’ve been doing our own digging into the charts and have seen a highly unusual amount of manipulation in recent days,” said Dave Zohrob, founder of Chartable, a startup collecting data on the podcast industry. Several people pointed to so-called “click farms,” where fake iTunes accounts subscribe to a show to game the charts. 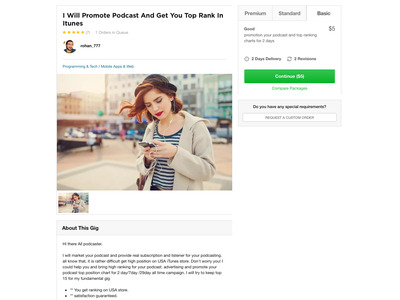 On Fiverr, a marketplace for online services, several vendors were offering “high position” on “iTunes store” for as little as $US5. “Although Apple doesn’t disclose how the chart rankings are calculated, our understanding is that the podcast show charts (ie, the one where Bulletproof Real Estate is #4) are calculated by subscriptions, whereas the podcast episode charts are more tied to actual listens,” Zohrob said in an email. Many of the new top podcasts didn’t have any episodes in the top episodes list, suggesting their rank had been manipulated. While the problem was fixed relatively quickly, as of Tuesday, reactions to the “weird” list still underscores the ultimate power that Apple has in the industry given the fact that it owns the main platform. “Lots of publishers don’t want to be named because they want to maintain relationships with Apple. It’s pretty delicate,” Quah said in an email. 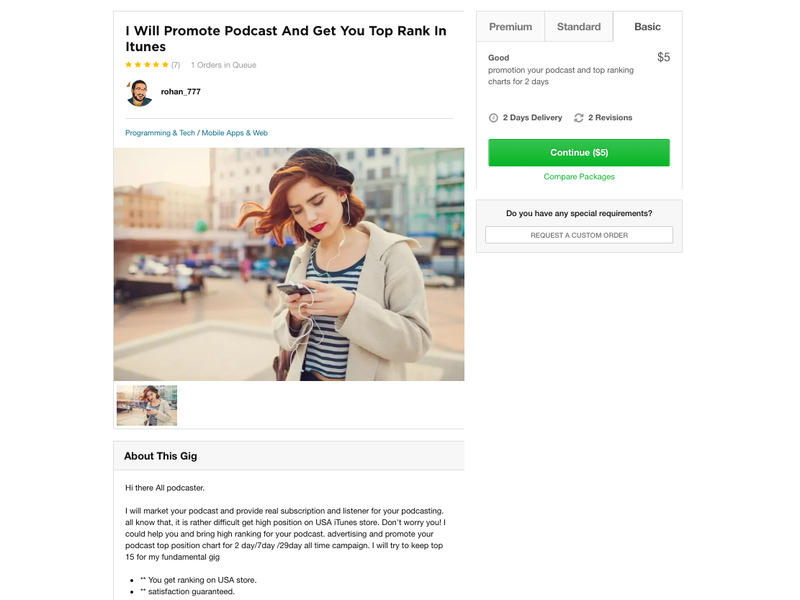 Have a story about Apple and podcasts to share? Email the author at [email protected] or Twitter DM at @kifleswing. Encrypted chat available upon request.